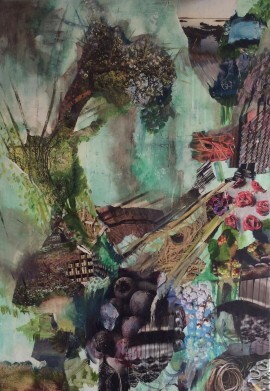 I have been continuing my exploration of surface, collage and paint montages. These have been deliberately done rather quickly as I wanted to initially let my instinct take over the creation and merging rather than use an analytical take. In ‘Strange ways’ I started with torn images from a magazine, focusing on patterns of lines and circles. These I quickly stuck onto a greenish painted surface, going for sense of movement, trying to follow the directional pull of the patterns themselves. Then I sat back and studied the resultant effect. It looked kind of weird, as if another sort of place in a different sort of time. I played with this eerie quality, darkening here, emphasising its strangeness sitting amongst the space. ‘Yellow and marble’ used a similar approach with magazine collage and pattern, although I covered the surface more thoroughly. The roughness of the painted canvas underneath was allowed to show through. 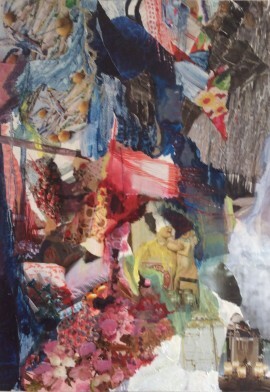 I scraped and swirled paint within bits of the collage emulating the pattern and gestures I could see. In ‘Doorways’ I cut out rectangles from the magazine, all neutral colours. These I pasted upon a roughly painted surface of black and white. The idea was to create portals and avenues through to elsewhere – working with invisible grids and lines to create different dimensions of space. Upon the surface I used ink to paint deviations and squiggles – like bits of loose cotton that have got caught within it. 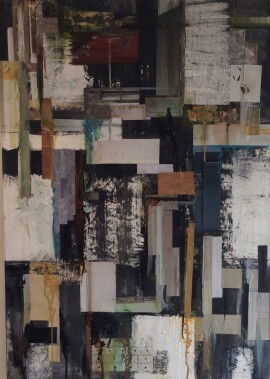 Drips and scratches permeate the canvas and close up you can see the texture and roughness of the collage and surface. 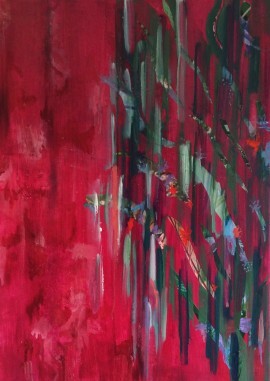 ‘Half-light’ started with a deep pink background. I collaged cut out shapes, reminiscent of leaves. I was aiming for something simple and graceful but the initial actual effect just annoyed me – it looked too stark and definite. I found myself finger painting with blues and greens, dots of red and coral, the marks falling down upon the raised surface. This I was happy with, like a tree in the rain. These paintings or collages – whatever you would like to call them are not meant to be complicated. They are not trying to say something deeply philosophical or be steeped in ‘art-speak’ terminology. They are simply me, responding in the way many of us respond to the world around us. If what is in front of us is familiar in anyway, then we assimilate this into what we already know, recognisable patterns, scenes and places. 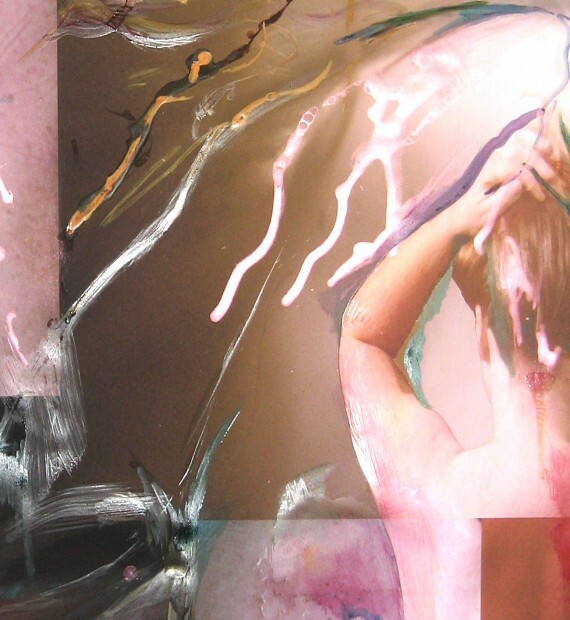 So a piece of collage, painted gesture or textured surface can speak to most of us– although exactly what is said may be quite different from person to person. Our brains are pretty good at crossing those borders to make sense of things whatever the medium that is used. However if it is new to us and unrecognisable, then we have to get our head around it, and accommodate it – a much harder task, but once done, it is a learnt experience and there for good.